Welcome to Marty's realm of tasty sensations. This series was born from the artist's desire to be near his newborn son Skyler. He set up his easel in the living room and arranged still life sets to paint. Through the eyes of his infant child, Marty found a new appreciation for the simple pleasures in life, the inanimate objects from our daily lives so easily taken for granted. With his new found perspective, an eggplant was no longer just a vegetable waiting to be carved up and thrown into a wok. It became a magnificent reflective ornament with individual character, full of life, color and purpose. Inspired by this realization, Marty began arranging still life settings on or near the window sills of his century old country home. Working directly from life with the effects of direct sunlight, he was able to capture in oil powerfully radiant images on small canvas panels. 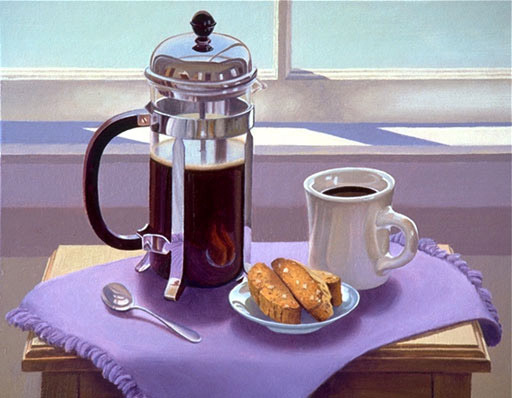 As a result, the objects in the paintings appear three dimensional, as if you could reach right in and grab a biscotti off the dish. Marty enjoyed the challenge of working with perishables illuminated by the sun's powerful rays. The essence of each subject had to be captured immediately before the sun's intensity slowly transformed the object's freshness. The selection of each thematic design was influenced by the artist's fondness and familiarity with the subjects and some were selected simply because of their dynamic color. With each setting, the objects were carefully arranged to create a simple yet striking composition. As the sun gradually worked it's way past the window, the ideal shadow direction was noted. 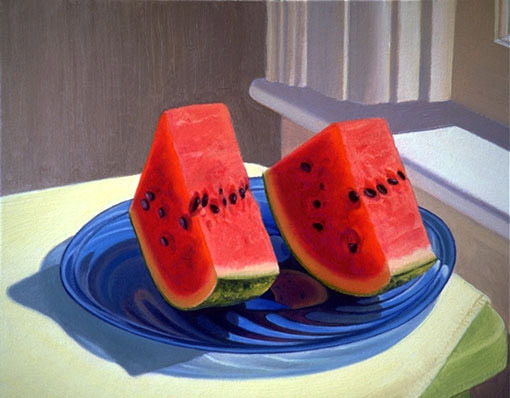 The actual creation of each still life painting occurred only during that time span until completion. As you may imagine, the Stanleys became very attached to this special collection of small paintings. They hung in Marty's gallery for several months and attracted a lot of interest from his clientele, but he and his family were not willing to part with them. He found a way to reproduce the collection of oil paintings and included a unique framing design he developed to enhance the artwork.